Woman hit by IndyGo bus and killed by second car. 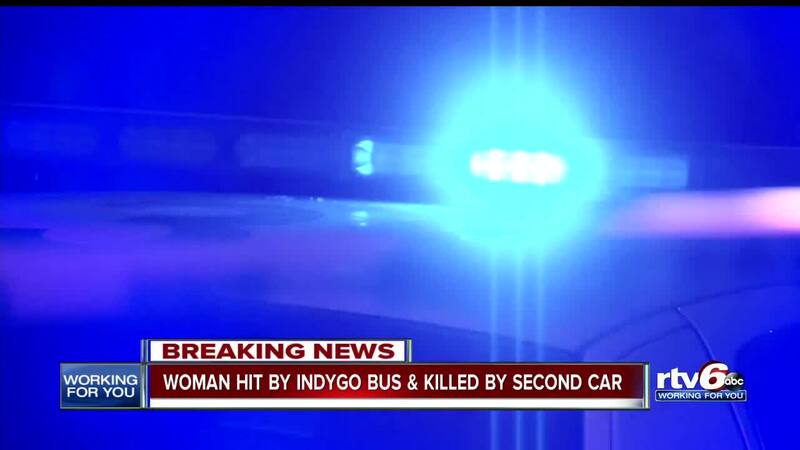 INDIANAPOLIS — A woman has died after being hit by an IndyGo bus and a second vehicle on Indianapolis' east side Monday night. Indianapolis Metropolitan Police Department officers responded to the scene near Dequincy Street and East 34th Street where a pedestrian was struck by an IndyGo bus. Witnesses say the woman was then struck by a second vehicle that fled the scene. Police believe the woman was walking along or in the roadway when she was clipped by the bus and fell into the lane on the opposite side of the road. Police say an oncoming vehicle in that lane hit the woman and then continued on. The bus driver is cooperating with police. Investigators say it's possible the woman was trying to cross the street or she may have been walking in the road to stay off the snow-covered sidewalk. The victim was not wearing any form of ID and police say they are having a hard time identifying her. Police say they've also received conflicting descriptions of the car that fled the scene and they are not releasing any details about a possible suspect vehicle at this time. If you have any information about the accident or a possible suspect please contact IMPD or Crime Stoppers of Central Indiana at 317-262-8477.